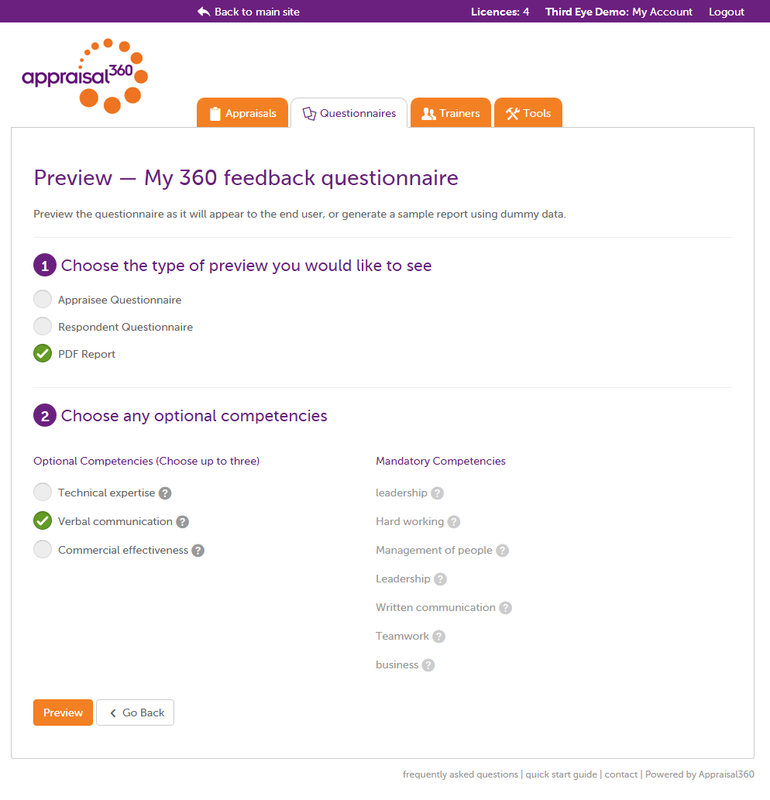 Tailor make 360° feedback questionnaires quickly and easily! 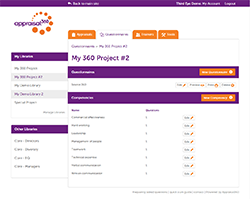 The profiler tool is the ultimate tool for designing, building and managing 360° feedback questionnaires. 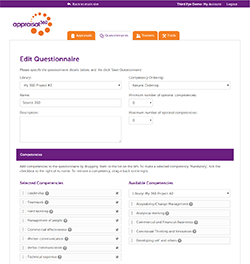 It enables you to rapidly tailor questionnaires to suit any organisation. You can create libraries of competencies, then rapidly build questionnaires by deciding which competencies you wish to include. You can both use competencies you’ve designed yourself and also include any of the ready built competencies that we provide. Check out the functionality below – click on the images to see the full size screen shots – and see how easy it is to build your own. You may want to set up a number of different libraries of competencies. For example you may want to have libraries set at different levels such as Directors and Middle Managers. Or you may have particular specialised applications, or it may be that you want to group your work with different clients separately. You give each library a name, and a description if you want to – and then you can add as many competencies as you want. 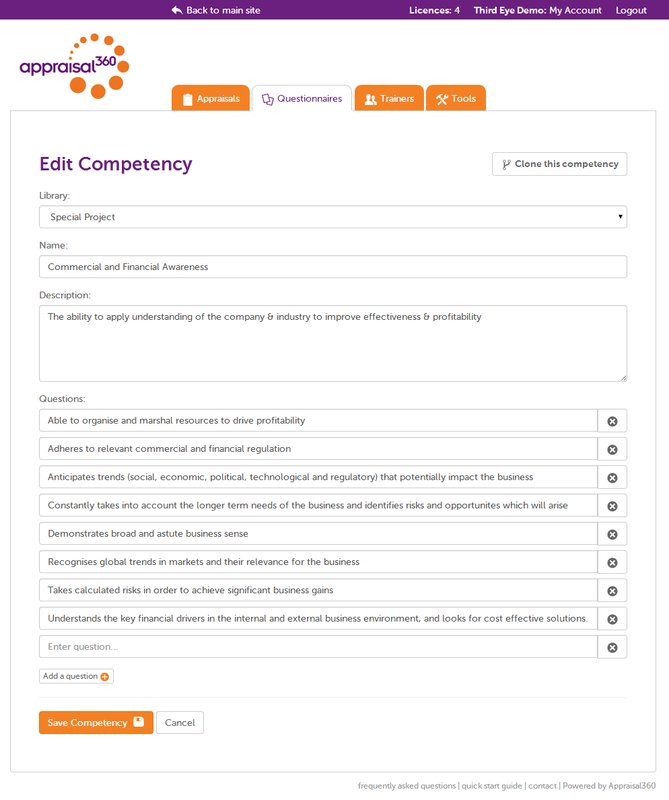 Each competency will need a description and then a number of statements or questions to underpin the definition. We recommend using approximately the same number of questions for each competency – around six to eight questions is usually about right. You can read more in our best practice factsheet on how to design good competencies and questions. Add your questions under each competency heading and save. Once you have defined your competencies you’re ready to start building questionnaires. You can use any of the competencies you’ve designed yourself and you can borrow from the pre-designed competencies that we provide. 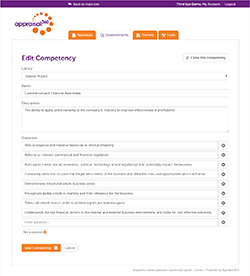 Give your questionnaire a name, select the competencies you wish to include, whether you want to make them mandatory or optional, add any free text questions and select the respondent groupings you wish to use. Then save the questionnaire and you’re done. 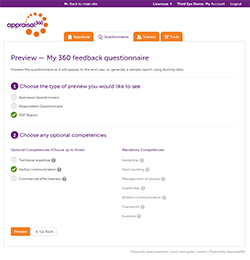 You can see exactly what your new questionnaire will look like to the end user by using the <preview> function. You can see the questionnaire exactly as an appraisee or a respondent will see it and even generate a sample report with dummy data. We recommend testing your questionnaires out on a number of people who’ve never seen them before just to check that they understand the questions as you intended them and that they really can answer them.